If you have ever had a chance to trim your hedges, then you know just how important it is to use a hedge trimmer. Hedges make up the most deliberate and distinctive features of our gardens and lawns. Hedges can act as boundaries or they can be used for decoration. The quality of maintenance you put into your hedges will greatly determine the general look of your garden since they are clearly outstanding and very easy to notice; only the best hedge trimmer will give you the quality results that you desire. The best thing about hedges is that they can be cut, shaped and manipulated into various patterns. A creatively well designed and completed job results to a spectacular scenery. Maintaining a hedge is not difficult, but for some reason, hedges tend to grow very rapidly. They might grow rugged and shaggy without you noticing until they are completely overgrown. If you have ever cleared these rugged edges using a manual handheld trimmer, you must bear witness that all the fatigue, itchy arms, and straining would rather be avoided using a powered hedge trimmer that can help you keep the bushes under control and neatly trimmed while saving you time and effort. 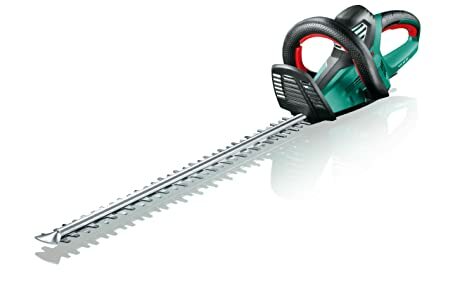 For those who are in hurry can check out our top hedge trimmers in UK for 2019 in below comparison chart. If you’d like details on any model, click on the links in the table or read our reviews below. Hedge trimmers come in cordless, electric or gas models, and they also offer single or double-sided blades and single or dual-action blades. Most blades are usually between 16 and 24 inches long, but they can be as short as 13 inches or as long as 30 inches. Hedge trimmer blades use a reciprocating action to cut branches cleanly and efficiently. Cordless hedge trimmers offer the convenience of portability and light maintenance. They start easily and don’t pollute the environment. But cordless models have the least cutting power of the three types of hedge trimmers. And the battery charge may not last long enough to finish your trimming. Recharge time may be as much as 24 hours on some models. Cordless models work well for small jobs and touch-ups, but they can’t match the cutting performance of an electric or gas trimmer. More homeowners choose corded electric hedge trimmers rather than cordless or gas models. Corded electric trimmers have push button starters, require little maintenance and don’t pollute the air. They’re relatively lightweight and inexpensive. And some perform cutting chores equally as well as gas models. Electric hedge trimmers are suitable for small sized gardens which require regular cutting and shaping of thin branches. The major drawback of electric trimmers is their dependence on a lifeline: the extension cord. Manufacturers suggest using a heavy-duty outdoor cord no longer than 100 feet with hedge trimmers. So greenery more than 100 feet away from a power outlet should not be clipped with an electric hedge trimmer. They are the best hedge trimmers for designing patterns and light trimming. Gas-powered hedge trimmers offer complete portability without the limitation of finishing the chore under the deadline of a battery charge. Their two-cycle gas engines provide plenty of cutting power, but those two-cycle engines also pollute the environment, generate lots of noise and require that you mix oil and fuel. Gas trimmers can be harder to start and can require more maintenance than cordless or electric units. They’re also generally more costly than electric or cordless models. Each type of hedge trimmer offers its own advantage, depending on your lawn care needs. Electric trimmers with cords give the best combination of cutting power, ease of handling and economy. Gas models offer the most power and portability. And cordless models make good light-duty or touch-up tools. Are you looking for an affordable yet powerful hedge trimmer that does it job efficiently? If so, you’ll definitely want to invest in the Flymo EasiCut. This trimmer is also very lightweight and versatile tool ideal for any garden. Lightweight ensures that you’ll have little to no trouble lugging it around. In return, you’ll be able to get your job done much quicker and you’ll still have plenty of energy after the job has concluded. Flymo EasiCut comes with a 45cm long cutting blade providing you enough space for trimming. It has a dual action blade with gap of 19mm which allows for precision cutting regardless of the task at hand. One of the best things about the Flymo EasiCut is the powerful motor. This specific head trimmer is equipped with a 450 watt motor. This is going to make a huge difference in the long run. Thanks to the powerful motor, you’ll never have to worry about the unit getting bogged down when cutting branches. It will get the job done right. Plus, you will never have to worry about utilizing gasoline. You can just plug in the power cord and begin using the trimmer immediately. All in all, the Flymo EasiCut is definitely a good investment. Nevertheless, it isn’t as powerful as gas models. Still, you cannot beat this hedge trimmer. It is reasonably priced and will definitely get the job done right. DeWalt is undoubtedly one of the most reliable companies in the industry. This is why they’re so popular among professionals. If you want to invest in a high quality hedge trimmer that is going to last a lifetime, you’ll definitely want to check out the DeWalt DCM563PB-XJ. This trimmer is superior in many categories. That is what most people expect from DeWalt and the company does not disappoint in this category. If you are sick of dealing with gasoline or the cord, you should definitely invest in this mode. You will be able to rely on rechargeable batteries. This will make your life so much easier in the long run. Plus, it is going to protect your lungs and the environment. 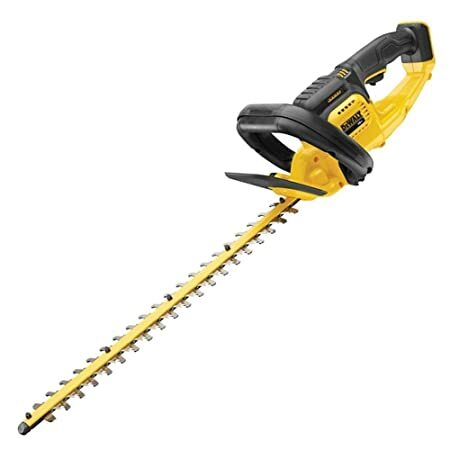 DeWalt DCM563PB-XJ comes with a 55cm dual action laser-cut blades with has 19mm cutting gap, that can easily slice through medium to thick hedge branches. This Hedge Trimmer operates on a Lithium-ion battery that when fully charged can provide you up to 75 minutes of uninterrupted use. It is also lightweight with compact design that puts little pressure on your arms or shoulder when use. What we don’t like is that this unit comes without a battery, you have to order the battery separately. At the end of the day, the DeWalt DCM563PB-XJ Hedge Trimmer is amazing. It is superbly powerful, so you’ll never have to worry about not being able to cut through those thick branches and leaves. If you’ve got extra money to spend, the DeWalt will prove to be well worth checking out. Bosch is another very trustworthy brand. The company has been manufacturing high-quality equipment for many, many years. When you invest in the Bosch AHS 65-34 Electric Hedge Cutter, you can guarantee that you’re going to get your money’s worth. This unique is lightweight, convenient to use and very powerful. If you’re going to be cutting through thick branches and leaves, you’re definitely going to need a powerful motor. This is where the Bosch AHS 65-34 Electric Hedge Cutter excels. This unique is equipped with a 700 watt motor. You can guarantee that it’ll have little to no trouble slicing through through branches up to 30mm thick. This hedge trimmer is about 3.8kg and with well balanced design that makes it easy and comfortable to use. The soft grip handles are very good addition and a see through hand guard ensures a safe working position with less effort in use. Laser-cut, diamond-ground blades with 34 mm tooth spacing. When it comes down to it, the Bosch AHS 65-34 Head Cutter is great, but not perfect. It just needs a longer cord. Nevertheless, an extension cord can solve that problem. With that in mind, you should not hesitate to invest in this trimmer. Choosing a hedge trimmer in today’s market can be quite the task with all the available options at hand. Well, that was at least until you found the VonHaus Cordless Pole Hedge Trimmer. This product is so innovative and unique that it was designed to be completely compatible with all other products in the VonHaus 20 Volt market. Do you have a 20 Volt VonHaus drill? Well, you can simply pull out the battery and utilize it for the trimmer. This little, compact trimmer has the ability to clean cut through branches and twigs that are 14 millimeters is diameter. Now, this is truly amazing when you sit down and consider the cordless capabilities and lightweight design of this product. 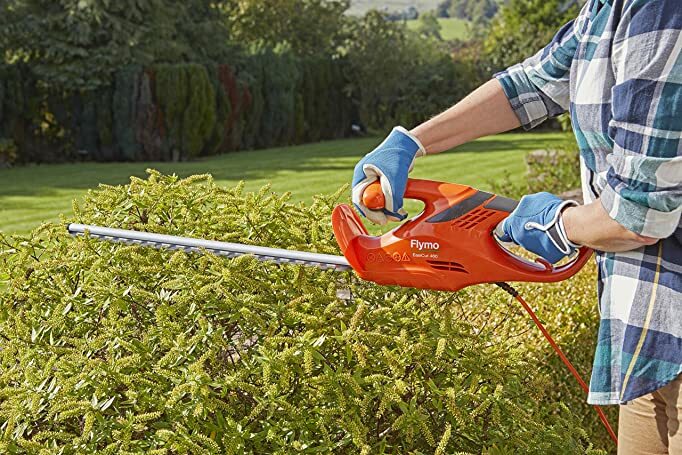 With its ability to adapt to any VonHaus 20 Volt product and its ability to cut 14mm branches and twigs, you are truly looking at one amazing hedge trimmer that can handle a variety of situations. Black and Decker is a name that has been around for years. Over those years their name has become known for quality and dependability. 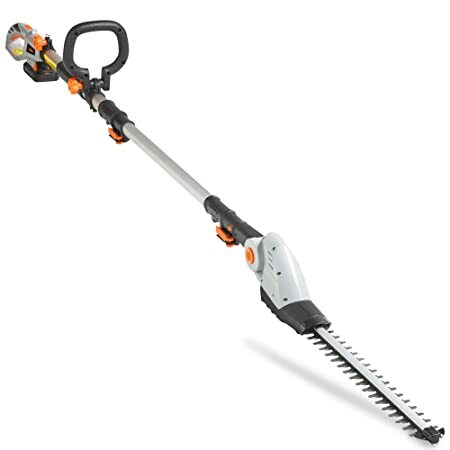 Those same exact qualities can be found in the Black And Decker GT6060 600W 60cm Hedgetrimmer. The long reach and nice balance of the Black & Decker GT6060 corded electric hedge trimmer make it a good choice for grooming hedges in hard-to-reach places. It is lightweight and the in-line body is easy to handle. The ergonomic handle provides grip control and comfort unlike anything else you will find on the market, which is a quality that cannot be overlooked in a hedge trimmer. This hedge trimmer gives good cutting performance in a lightweight, well-balanced, long-bladed trimmer with the convenience of a plug-in unit. It will work well for the homeowner with wide or high hedges or bushes. It’s angle blade can easily slice through leaves and branches of up to 25mm thick. 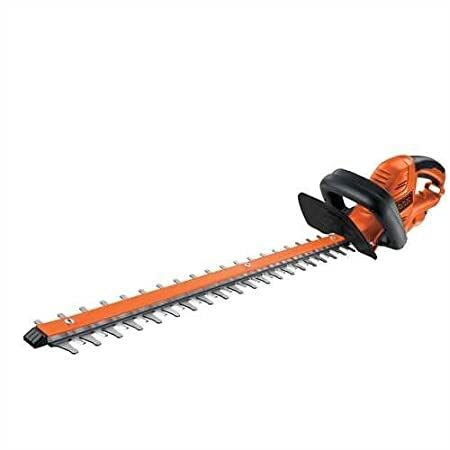 If you are seeking dependability and reliability in a hedge trimmer the Black And Decker GT6060 600W 60cm Hedgetrimmer should be right up your alley. What and how much do you plan to trim? If you need to trim several bushes around your yard and/or typical hedging, a corded model will probably provide everything you need. But if you have a mile of high hedges or lots of scattered bushes, you’ll appreciate the extra power of a gas model. If your trimming needs are limited to small chores, you can complete the task on a battery charge, so in these cases a cordless model may be all that you need. Where do you plan to trim? If your yard is a typical city lot — 100×100 feet or less — or if you have strategically placed power outlets, you might get the best use from a corded electric trimmer. Close neighbors will appreciate the quieter electrical unit. On the other hand, if you have hedges or bushes more than 100 feet away from a power outlet, you will have to opt for a cordless or gas model. Remember, cordless models work well for small, light jobs, but if you need real portable cutting power, you should shop for a gas model that you can use anywhere for extended amounts of time. How tall and wide is your hedge? The average hedge trimmer is designed for the average hedge, considered to be about 5 feet high and 5 feet wide. While hedge trimmers aren’t particularly heavy, often in the 6- to 12-pound range, you may have to lift them above your shoulders or even above your head to reach the top of a hedge, so you need to consider your upper body strength. Your arms, shoulders, back and neck can quickly tire from holding a 10-pound trimmer above head level with your arms extended. Long blades obviously lengthen the reach of a trimmer, but they also add weight. Be sure to lift each model, and lift it high, when you are shopping, so you can get a good idea of how comfortable it will be to handle the unit. How thick are the branches of your hedge or bushes? The thickness of the branches will partly dictate the size of the blade gap that you will you need in order to cut the branches. For the safety of your fingers, the blade gap of residential models is usually limited to 3/4-inch. Within that guideline, the wider the gap, the larger branch the trimmer will cut, and the more quickly and efficiently the unit will cut smaller branches. What is your budget? Corded electric hedge trimmers are the least expensive of the three types, with some models selling for less than £50. Some high-end models, however, are priced up to £150 or more. Cordless trimmers offer portability and can actually cost more, yet they provide less power. And gas models, which are the most powerful of the three types, can cost several hundred dollars. Below are some factors that you should consider before selecting the best hedge trimmer for your tasks. More powerful trimmers can serve you well if you own a dense vegetation of poorly maintained hedges. Powerful hedge trimmers can cut thick branches and align misaligned edges. Gas or petrol powered trimmers are the most powerful handheld trimmers with power ranging from 400 Watts to 900 Watts. If you own a well-maintained hedge with thin branches, you might require only light trimming tasks and slight leveling. A low powered corded trimmer will be the best hedge trimmer for you. A single action blade trimmer is made up of one moving blade which cuts against a stationary blade. It is cheaper because it has less moving parts. Its disadvantage is that it does not produce fine cuts and it releases a lot of vibrations. You can comfortably use a longer single-sided blade because these units tend to be lighter than their double-sided counterparts. Using that longer blade, however, takes extra upper body strength and coordination. A double action blade trimmer has both of its teeth cutting against each other in opposite directions. This makes the cuts very smooth and effortless. 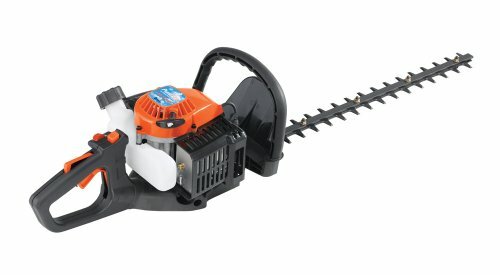 If you are used to trimming hedges for extended periods, the double action blade hedge trimmer is best for you since it produces minimum vibrations. These models are most efficient for cutting hedges up to about chest height because they are heavier than single-action trimmers. If you trim hedges as an occupation or at professional levels, the double action blade trimmer is also highly recommended since it is more powerful and it results in clear cut finishes. The thickness of the branches on your hedges will help you to determine the size of spacing you require between the teeth of your best hedge trimmer. 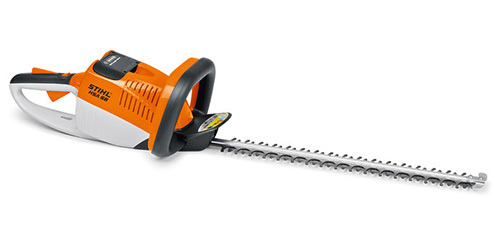 The wider the gap between the teeth on the blades of a hedge trimmer, the larger the branches it can cut and the more quickly it will cut small branches. But safety can become a real concern; the gap between the teeth on the blades of residential hedge trimmers should be no more than 3/4 inch according to Underwriters Laboratory. That’s to keep your fingers safe from fitting between those teeth. Some commercial models come with wider gaps between their teeth. For your safety, we urge you to stick with a residential model with a gap of no more than 3/4 inch. Another safety feature to look for is stationary tooth extensions rather than tooth extensions that move with the blade. A regularly maintained hedge can use narrower teeth of about 20 mm. You need to determine the teeth spacing that will be effective for your hedges, but keep in mind that wider spacing between teeth will leave a rugged, rougher cut, while narrow spacing will result in finer cuts and finishes. For a cordless hedge trimmer, you should always consider what type of battery it has and how long it takes to fully charge the battery. This will help you with your power plan on projects. You will be able to monitor your time so that you are not cut off while in the middle of a job. If you need more power, you will be forced to purchase more batteries and charge all of them, then use them one after the other until you complete your task. 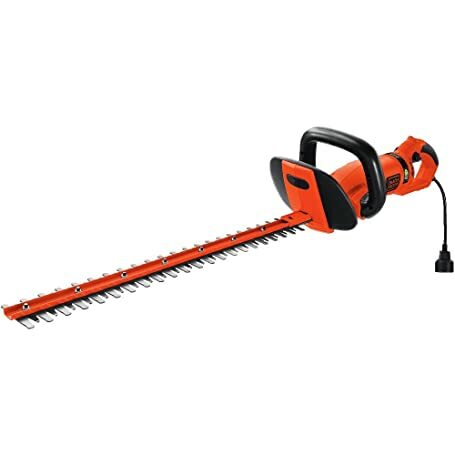 Gas powered hedge trimmers are heavier so you should select a weight that you are comfortable with. You should always look out for control features that have been simplified to avoid straining which might lead to muscle injury and quick fatigue. Look for a hedge trimmer that has anti-vibration features that reduce the vibration of parts that you come in contact with, such as the handle. As for the handles, it may be wise hold some hedge trimmers while shopping. Is the handle comfortable? Does the unit feel balanced in your grasp? Make sure the position and type of controls lend themselves to easy use. The unit you choose has to be comfortable in your hands. Due to their sharp teeth and cutting nature, hedge trimmers can be quite dangerous to use. You should look out for specific safety measures installed on the machine to make it safer to use. Some things you can look out for are; automatic braking, used to stop the blades in case something gets jammed onto the teeth. This prevents injury and destruction. Hedge trimmers throw debris and make lots of noise. We recommend you wear gloves and eye protection when you operate any hedge trimmer and ear protection is helpful when you operate any gas unit. If you must work on a ladder, be sure it is steady. PreviousDigging Your Plot: Single Dig, Double Dig or No Dig?